We are back with Battle of the Minis Part 3, The MakerBot Replicator Mini 3D printer review. This Mini 3D printer is another that might not seem quite so “mini” when you put the box in your car to take it home, or is delivered to your door. This is the second review in this Battle of the Minis series that qualifies as a mini 3D printer because of the size of objects you can print, not the size of the 3D printer itself. While this mini 3D printer is not the smallest one you can buy to fit on your desktop, it’s quality and ease of use are among the best we have experienced. Let’s dig into the details. The MakerBot Replicator Mini box is made from double thick corrugated cardboard with black line printing, nothing fancy but very strong. Once you open it the experience is top notch. You are presented with a thin inner box that contains the Getting Started Guide, Owner’s Manual, power cord, USB cable, Starter Filament Spool, Smart Extruder +, base plate blue tape, and some other small parts. The printer is packed with expanded foam corner protectors. Once you remove the two top protectors you can simply lift the printer out of the box. It is heavier than I expected, a thick sheet metal back panel among other materials provide a robust structure, but contribute to this mini 3D printer being the heaviest we have tested yet. 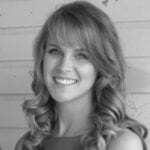 The packaging contributes to a top-notch user experience from the very beginning. Preparing the physical printer for use involved removing special tape that holds the front clear door shut, and the side panels, preparing and inserting the build plate, installing the Smart Extruder +, and loading filament. The Getting Started guide is a handy reference for the fourteen steps it takes to get up and printing. That may sound like a lot of steps, but the steps have been broken down into ultra simple tasks, so it does not take very long to accomplish. One of those steps is to take a die cut piece of blue painter’s tape and apply it to the plastic build platform. The blue tape is die-cut with three noticeable notches in it that correspond to three exposed metal discs in the top of the build platform. These are important for the Replicator Mini to automatically calibrate the level of the build plate, which it does before every print. So if you buy blue painter’s tape in bulk like I do (I get a 6” wide roll from McMaster Carr), you will need to use a utility knife or X-acto blade to cut the tape away that covers the three metal discs. Once the tape is installed, inserting the build plate in the 3D printer is very easy, just push it into place and it snaps in. Removing it is just as simple, just pull until it disengages from the Z-axis assembly. Another critical step is to install the Smart Extruder +. This is one of the most unique aspects of the MakerBot Replicator 5th Generation line of 3D printers, including the Replicator Mini. With most other 3D Printers on the market, the extruder is a permanent part of the machine that cannot be replaced, only the small metal nozzle (tip) can be replaced. The MakerBot Replicator 5th Generation 3D printers combine the extruder, filament feed system, sensors for bed calibration, and filament feed detection into one replaceable component. For owners of this series of 3D printers, if you bought one a couple of years ago, as we did, when they made improvements to the Smart Extruder you have been able to buy a new one and upgrade your 3D printer to the same quality and capability as what customers are buying when they buy a new MakerBot 3D printer today. 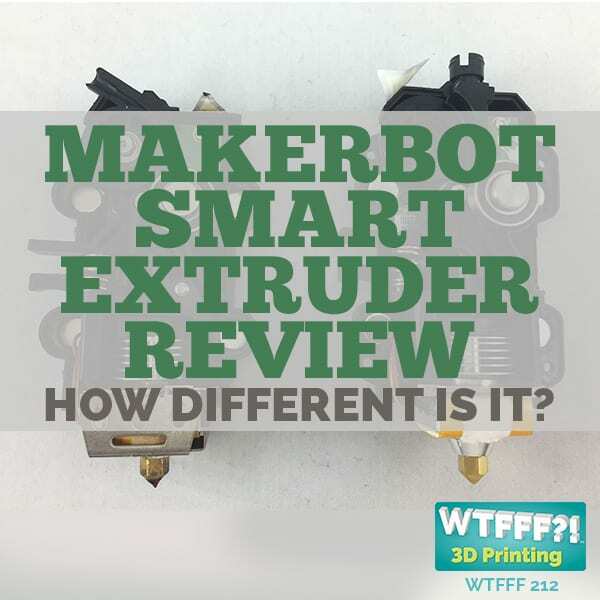 The reality of the interchangeable Smart Extruder, and backwards compatibility for new features and functions is a major reason that the MakerBot line of 3D printers is a little pricey. But compared to the cost of buying multiple new 3D printers to upgrade at the same pace, in the end these 3D printers may actually cost you less. Also on most other 3D printers, the filament feed system is separated from the extruder, so the filament is pushed (usually form the back of the machine) up and over the top of the machine, down and into the top of the extruder. I have experienced many different 3D printers, those that push the filament from far away into the extruder, and those that pull the filament into the extruder. I far prefer the ones that pull the filament into the extruder. My strong opinion is that 3D printers that have a filament drive motor moving around with the extruder, pulling the filament in, are more reliable, and produce better quality prints. To install the Smart Extruder, all you do is unwrap it from its packaging materials, orient it properly, and follow the diagrams to place it in the correct location. Pins and magnets guide and hold it in place, so you just pop it in. There are a few functional features noticeably absent in the MakerBot Replicator Mini, especially for a 3D printer of its price point ($1375 at the time of this review). There is no LCD Display, to control the 3D printer you need to connect a computer to it via USB or Wi-Fi. I experienced that if my laptop went to sleep during a print, when I went to change the filament after the print was complete, the connection between the 3D printer and the computer had been lost. 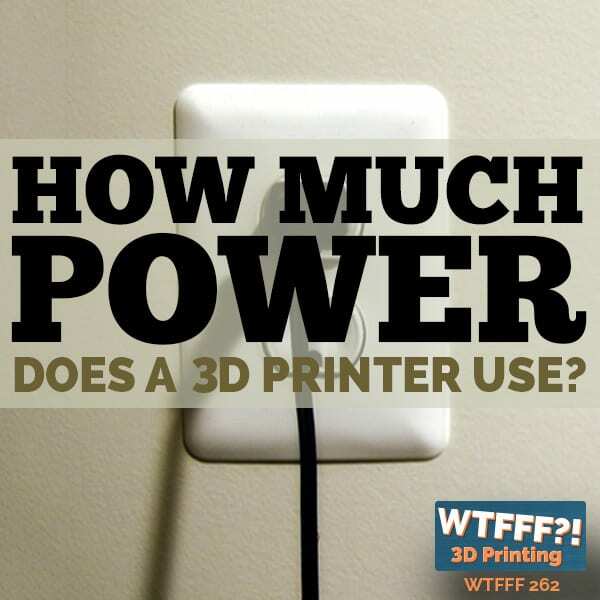 I had to unplug the USB cord of the 3D printer, and another time cycle the power of the 3D printer. This is very inconvenient, and increases the time necessary to perform a print job. So the decision to omit an LCD display and control knob (probably to save cost and differentiate the lower cost model from its closest cousin) is having a negative impact on user experience. Despite the lack of LCD display, a significant benefit of owning a MakerBot 5th Generation Replicator 3D printer is that they have made an APP so you can monitor and control your 3D printer from your smartphone. That means you can choose a file to print, send it to the printer, pause, resume, view the status of your print via the 3D printer’s onboard camera, and much more. In lieu of a LCD display MakerBot added a multi-color illuminated “Action Button” to provide feedback on the status of the 3D printer. There are so many different functions this button performs that it was difficult for me to remember them all. So I needed to keep the Getting Started guide handy to be able to interpret and properly control the 3D printer. Also absent is a USB or SD card slot for printing without a computer actively connected to the 3D printer. 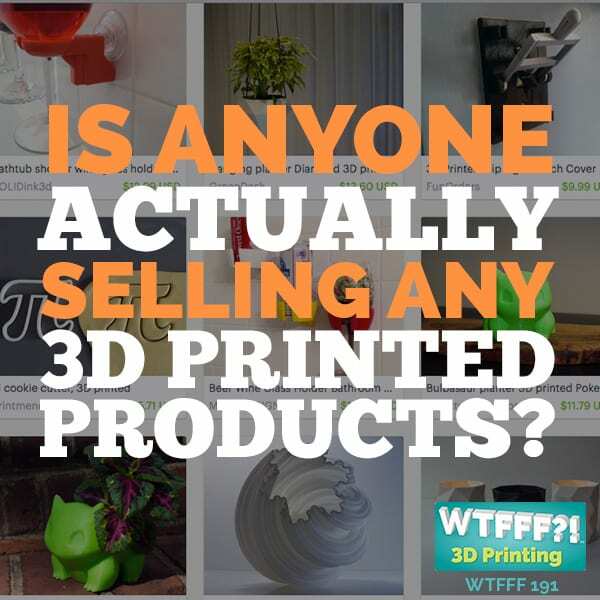 I often prefer to prepare a print and save it to a file so I do not need to have my computer actively connected to the 3D printer in order to print. Also, with many 3D printers I find the USB or Wi-Fi connection to be unstable, and a direct print from file function to be completely stable. So far the XYZ daVinci Jr. is the only 3D Printer so far in our Battle of the Minis series that has a memory card slot for printing without a computer connected. 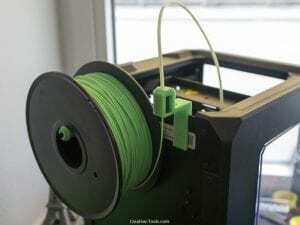 The Filament spool housing on the Replicator Mini is easier to use than the one on the larger Replicator. While it is only large enough for a small MakerBot spool, the relatively thin Sheet metal back panel of the 3D printer is ideal for mounting a larger spool “outboard”. I have seen some photos online showing how others have 3D printed special adapters to mount a large spool in this way, very clever! The software installation was ultra simple. 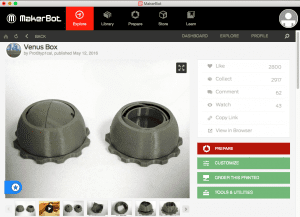 You just go to Makerbot.com and download he latest version of MakerBot’s Desktop software. Once installed and opened, it will detect the 3D printer and check to see if its firmware needs to be updated. In my case the software did detect that there was a firmware update for our test 3D printer, so I let it download and update the firmware before I even loaded any filament into the 3D printer. This process was simple and as seamless as it should be. The MakerBot Desktop software shows you the status of the firmware download, and the progress of writing it to the 3D printer. When complete it restarts the MakerBot Replicator Mini, and you are good to go. Before you can send print, you need to load some filament. As is the case with most 3D printers, to make sure the filament feeds into the extruder consistently, you need to thread it through a plastic tube. On the MakerBot Replicator Mini, the filament tube is mounted on a black molded plastic clip that snaps onto the right side of the filament spool pocket. You have to remove this plastic clip in order to install or remove a spool of filament. So the way this process works, you need to install the spool in the pocket, and feed the end of the filament into the plastic clip (and white filament tube), threading it all the way through, then snap the plastic clip in place. This is a cumbersome process, requires some balance and coordination, and is not the user-friendliest aspect of this 3D printer. It is not the end of the world, but I wish it had been done in a way that you could install and thread filament without disassembling and reassembling parts. The MakerBot Desktop software is very straightforward. You first need to add a file to print, either by loading an STL file that you have created, or one that is downloaded from the Internet. 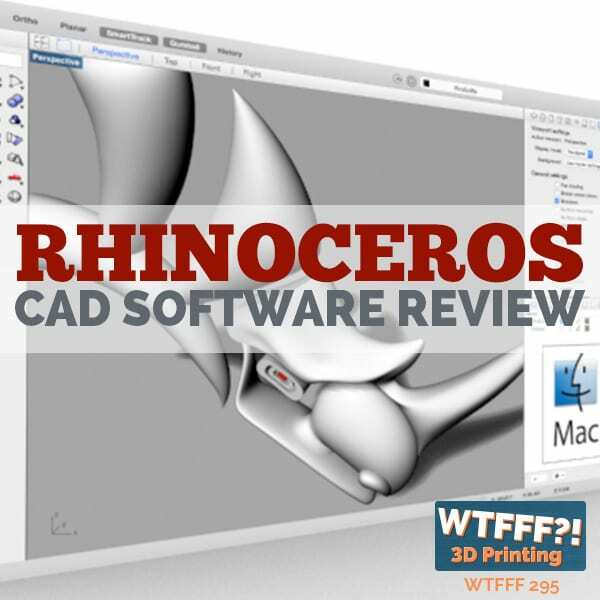 Since MakerBot owns Thingiverse, the largest 3D file repository, they have made it accessible directly from within the desktop software. You can search for a file to download and print from Thingiverse without ever leaving the MakerBot software. The experience is different than for anyone else who just goes to Thingiverse through a web browser, because when you find a file to print through the MakerBot software, there is a button integrated into the user interface called “PREPARE.” When you press this button it automatically downloads the STL file, and loads it into your MakerBot software for you to choose the print settings, and then send the print to your printer. MakerBot Desktop with Collapsible Coffee Sleeve STL file loaded. 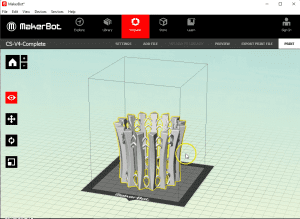 MakerBot’s Software simplifies the slicing settings in an easily understandable way. At its simplest you can choose between Low, Standard, and High resolution, and select Print. Another unique aspect of the Replicator Mini is that it calibrates, or levels the build plate automatically before each print. There is no option in the software to stop it from leveling the build plate. I think that is the way it should be, that the build plate is just always level, and the user never needs to think about it. Of course this is easier to do on a Mini 3D printer, which has a small build surface. 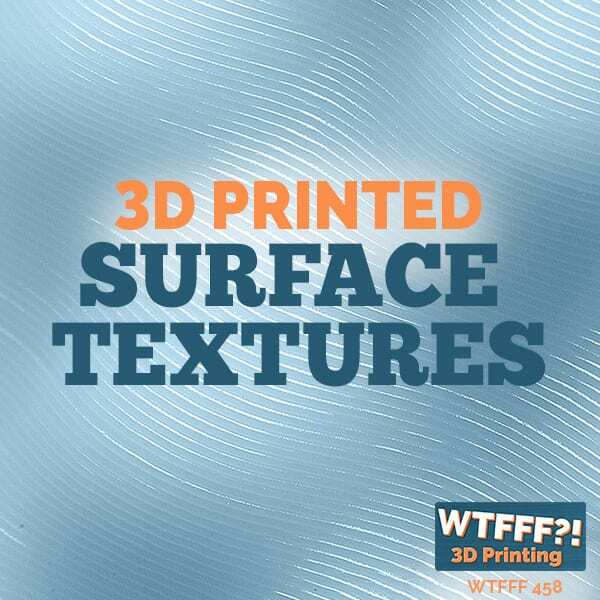 For those that want a little more control you can get into the details of the settings, independently adjusting temperature, layer thickness, speed, etc. There is one caveat to the settings on the Replicator Mini 3D printer, which requires a raft. So the MakerBot Desktop software will not let you deselect the raft setting when you prepare a print for the Mini. I do not think this is a big deal, because in my experience printing on a MakerBot 5th Generation 3D printer, I found that the quality of my prints is always better if I use a raft. 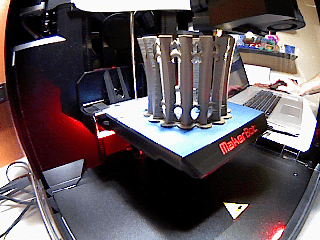 I have tried it many times without a raft in an effort to reduce print time, but I always end up increasing the time it takes me to get a good print, because I inevitably have to print it several times, and finally print it with a raft anyway. I have learned over several years of 3D printing that I can try to save time, but usually the print quality will suffer as a result. So most of the time I sacrifice speed for quality, and just accept that printing one time more slowly is faster than attempting to print faster several times. The software also has tools to help you scale a model, reposition it, or rotate it to change orientation to the build plate. You can also zoom in or out to view the details of your model, rotate your view to see any side of your object, and even view the sliced model layer by layer to confirm it is going to print as you planned. While the MakerBot Replicator Mini 3D printer is the most expensive Mini 3D printer we have tested so far, but if you can afford it, the quality product, user experience, and print results are well worth it. Before you decide to buy a different mini 3D printer simply because of the price, consider how much your time, upgradeability, and reliability are worth. For my money, MakerBot is hard to beat for predictable quality results. I would like to know how much it cost and do you delevery in canada, Québec?